The first day of Vegan MOFO is finally here. We will be posting a minimum of twenty-six days in the month of October to celebrate. We have chosen the theme “Vegan A-Z” and will be going through the alphabet highlighting different things we find important about vegan food and nutrition. We have also been asked to be guest writers on Vegan Mainstream and our first post will be up on October 7th. Make sure you check out the blog roll on VeganMOFO to see all the other amazing bloggers participating. There are about 700 this year. Pretty awesome! I have been reading about agar (also called agar agar) for years but have resisted experimenting with it because it can be a little on the pricey side. I have been told by my friend Monica that it might be less expensive at an Asian grocery store which I will need to check out again. While reading about it I also learned that the Chinese and Japanese call it by a different name. The Japanese call it kanteen (thanks Babe.) Monica told me about the Golden Coins brand powder that can be found for as little $2 for six ounces rather than the $9 I spent one ounce. Um…yeah…SUCKER is written all over my forehead and I think my extremely frugal husband is breaking a sweat. Good thing he loves me! Agar is derived from red algae and is used as a thickener due to gelatinous like quality. It is often used in desserts in Asian Fare but I have been more interested in its qualities for making a brick style cheese. After reading every recipe I could find on the net it was time to give it a try for myself. Over the years I have gotten pretty good at making cheesy sauces that the snobbiest of cheese fans will eat, so I figured if I could convert one of those into a brick of cheese that I could grate, it would be pretty good. Understanding the science behind cheese is the important part behind creating a mock cheese. Basically you need an acid, salt and fat, plus the right balance of nutritional yeast (I personally don’t like the aftertaste if there is too much.) While stumbling around the net reading about agar and cheese making I came across this great page on The Accidental Vegetarian about cheese science. I’m warning you now that I don’t know what else is on the site so please don’t get upset with me if there are recipes that aren’t vegan, this page simply explains vegan cheese making terrifically. For my first attempt I for the most part doubled the recipe in my mac n’ cheese changing a few things slightly. Mix the ingredients with a whisk from the butter to the tomato paste, adding a little of each ingredient at a time until you achieve the flavor you want. Add lemon juice in tablespoons and try after each one because each lemon will have a different level of bitterness. Once you have the flavor you want then add your cashew cream. After getting your sauce the flavor you want begin to cook the agar flakes. In a sauce pan mix agar and water together and bring to boil stirring occasionally. After it reaches the boiling point cook for five more minutes. 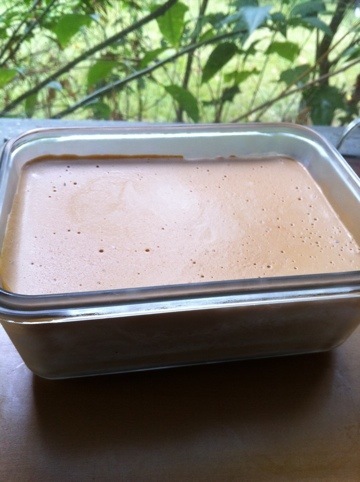 Immediately afterwards pour cheese sauce and agar mixture into a blender and blend until mixed completely. Pour mixture into a well greased dish. I used a glass 5″ x 7″ x 2 1/2″ container and as The Accidental Vegetarian recommended I let it sit uncovered in my fridge overnight. Should keep, if covered for 5 days. Our taste test: So we cut into it this morning. I was scared, the little vegan was excited and hubby was indifferent. Flavor was mild. Consistency much like other vegan cheeses with a Velveeta like texture. I would not cut into it and use on a cheese platter but that is the way I am with all vegan cheese. I look forward to trying to grate it and try it in some recipes. We love our mac and cheese but the sauce lacks texture and I think it will be great for that. I will repost on here after I try using it cooked. The little vegan really wants a grilled cheese so that may be our first experiment. Next time I will cut the recipe in half and try my Swissy Sauce. Now that I have found cheap agar I don’t mind playing! On the plus side, our dog Felix loves it! So I experimented with the cheese, Tofurky and tomato on sourdough. First I put a couple of slices of cheese and then open fast broiled it in my toaster oven for 5 minutes. It didn’t melt but became spreadable so I spread it with a knife. Then I added the Tofurky and tomato and grilled it like you would a regular grilled cheese. Tasted pretty good but I would still like to play around with it after Mofo is over. Gallery | This entry was posted in A - Z MOFO 2011 and tagged agar, cashew cream, nutritional yeast, nutrtional yeast, vegan, vegan cheese. Bookmark the permalink. I can’t wait to hear how the grilled cheese experiment goes! I love your A-Z idea, so creative! I have yet to work with agar, mostly due to price, I’ll have to try Golden Coins now, thanks. Yes Leslie, glad the dog loves it because with all the other cooking I need to do this week I am not sure how much I will get to use. Sarah & boychucker, thanks! There are still a few letters that I need to figure out but I have most of them covered:) Boychucker the Golden Coins thing is awesome! Looking forward to hearing about how this cooks.